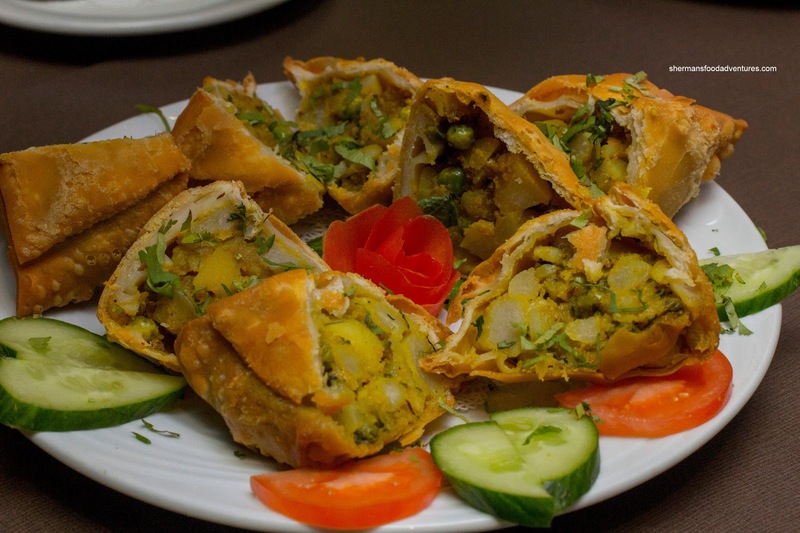 In the GVRD, there are certain areas that feature specific cuisines. 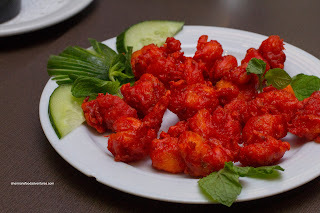 We have Chinese food in Richmond, Korean along North Road, Vietnamese on Kingsway, Indian food in Surrey and in North Van, Persian. But wait a minute. Palki Indian Cuisine? Okay, call me picky, but I've had some pretty average Indian food outside of Surrey. 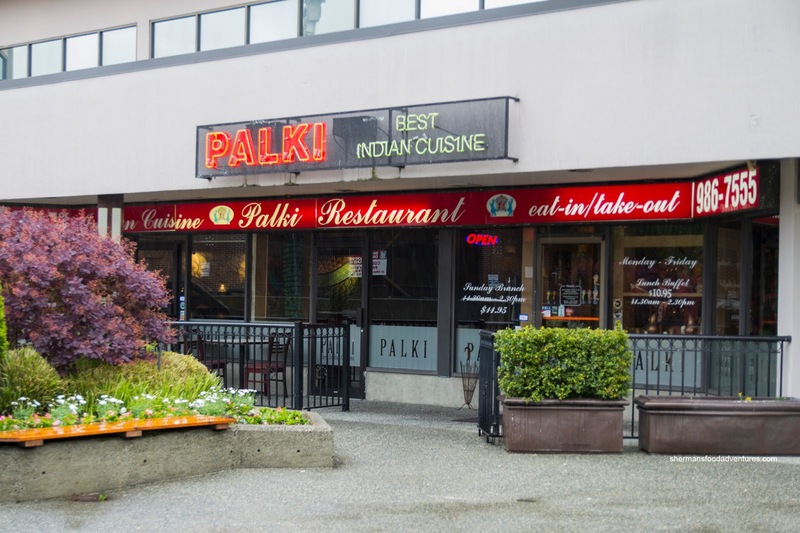 It's not that they don't try to make "real" Indian food, but the local clientele dictates what they serve. Last year, I had already tried their Commercial Street location and came away satisfied. 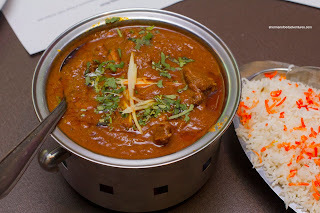 I recently got an invite to try their North Van setup and was treated to a variety of food including their made-to-order curries. We first started with some appetizers including the one order each of the Chicken and Prawn Pakora. The chicken was intermittently crunchy and not-too-greasy while being moist in the middle (it was white meat). As for the prawns, they exhibited a nice snap but were not as crunchy. These were sweet with a slight spice. Next, we were presented with a platter of Veggie Samosas which were crunchy, light and minimally greasy (since the wrapper was quite thin). The filling was loose and not heavy with a mild mix of spices. Served on the side was a sweet and spicy tamarind chutney and mint chutney. 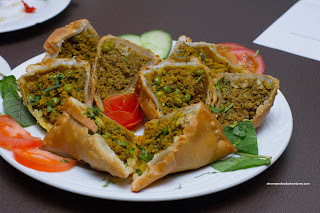 On a separate dish, we had some Meat Samosas which were probably packed with too much filling. It was rather dry and crumbly. It was almost as if it needed to be greasier. I liked the sweet onion flavour in addition to the spices, but the peas were pretty hard and dense. The veggie samosas were our favourite in comparison. There was one dish that was not part of the original plan, which was the Curried Mussels. There was nothing inherently bad about the dish, but it wasn't exactly outstanding either. 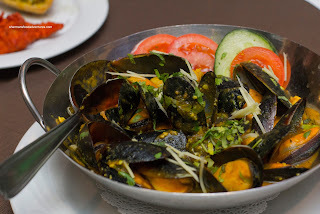 The mussels themselves were cooked just right in a spicy and nutty sauce. But the copious amount of salt overwhelmed everything. Moving onto the main event, we had the standard, the Butter Chicken. All of our curries were served in their own chaffing dishes which kept them warm throughout our meal. 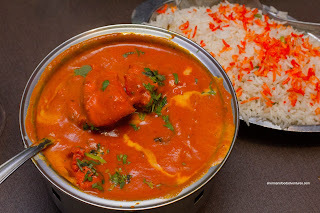 The butter chicken was balanced between cream and tomato where there was a definite heat (we requested spicy). However, on a personal level, I could've done with even more. The big pieces of white meat were moist and tender. One of my favourite dishes arrived next, being the Lamb Rogan Josh. I thought the lamb itself could've been a bit less dry, but it was hardly chewy. Again, there was a good spice level and depth of flavour. Again, it was a bit heavy on the salt. Probably my favourite of the bunch was the Saag Paneer. 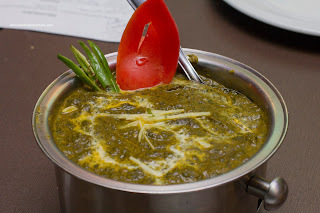 Unlike a palak paneer, this one was made with broccoli in addition to spinach. The best part was the paneer as it was buttery, soft and light. Smooth with little bits of spinach, the creamy sauce was mild and was a perfect compliment to the cheese. 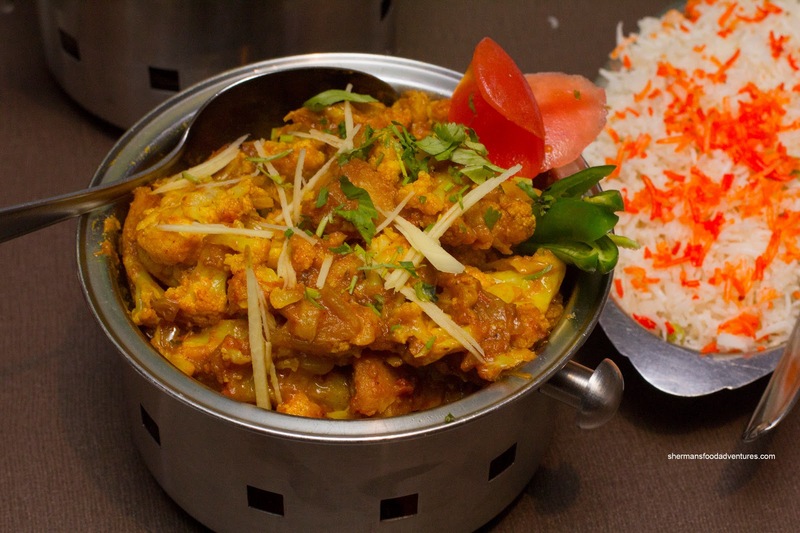 Continuing on with another vegetarian offering, we had the Aloo Gobi. The potatoes were fork tender while the cauliflower was slightly more firm. The spice level was noticeable while the predominant flavour was ginger. This was a nice break from the previous heavier dishes. 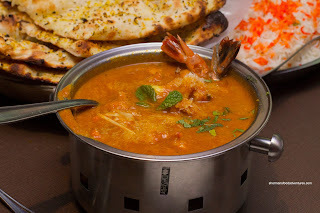 Our last saucy dish was the Prawn Goan Curry. It was spicy and aromatic (from the coconut). Again, there was a pronounced ginger flavour as well. The prawns were cooked just enough so they retained a snap while exhibiting their natural sweetness. 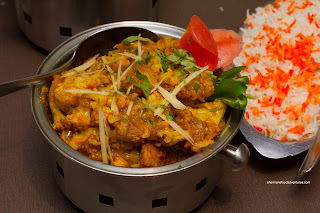 Our last savoury dish was something I've never had before being the Chicken Hariyali. 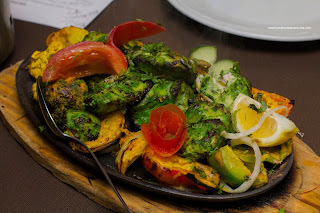 Similar to chicken tikka, but marinated with ginger, garlic and spices, it took on a rich green hue due to the use of cilantro and mint. For me, I could pick out ginger once again which still came through even though the dish was spicy. 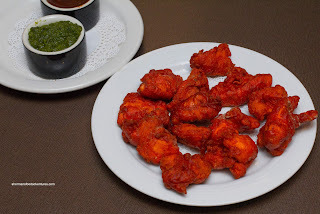 Although the chicken was moist, I personally prefer the classic tandoori chicken or chicken tikka more. We were served rice, papadoms and Garlic Naan on the side. 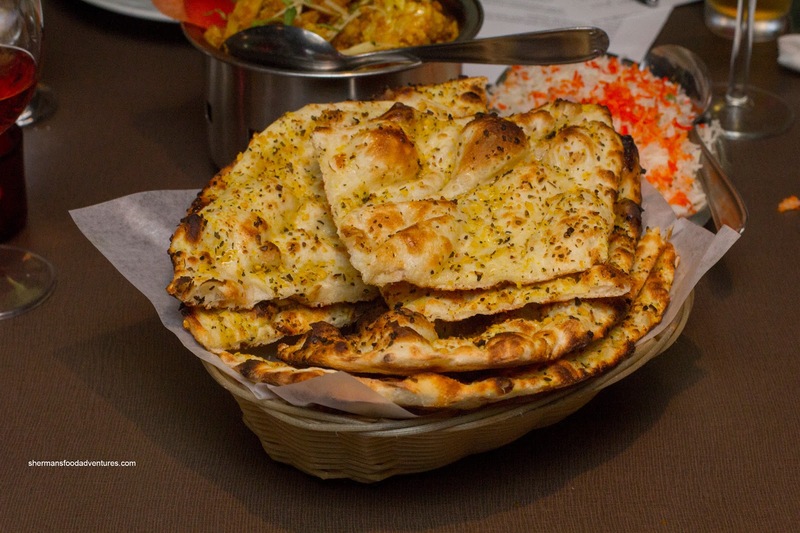 I really liked the Garlic Naan as it was charred well relatively evenly throughout. Hence there was a crunch and nuttiness to the bread. Once past that, it was chewy and soft with a good hit of garlic. We finished off this feast with 3 desserts consisting of Gulab Jamun, Rice Pudding and Kulfi Ice Cream. 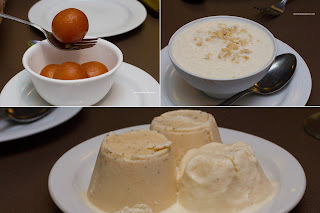 Personally, I've never been a huge fan of gulab jumun, but this one wasn't too sweet. The kulfi ice cream was not bad, yet I didn't get much in the way of cardamom. Overall, with the amount of dishes sampled, the meal could be considered good. The spice level and quality of food is pretty good for North Van and more so.